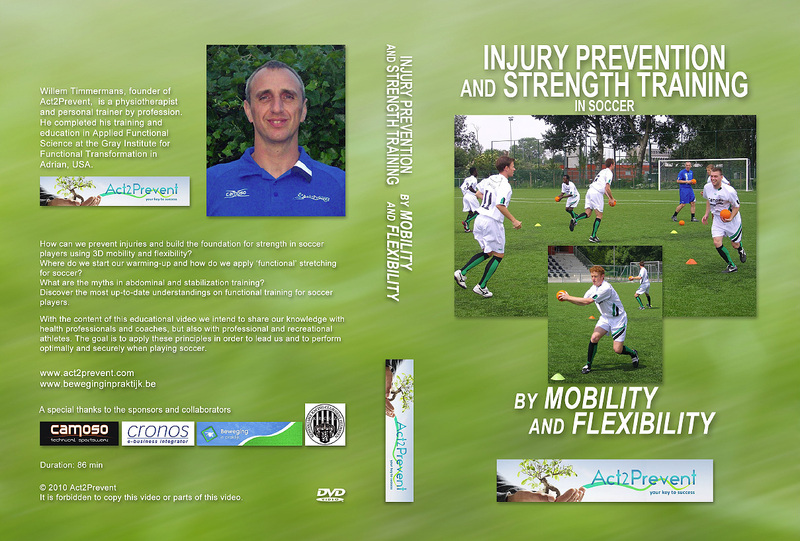 In 2010, Willem and Act2Prevent brings out a DVD which will be a guide for soccer-trainers, clubs and players: how can mobility and flexibility-traning be used as a tool to prevent injuries and be the fundamental for strength-training? Where do you start your training? How do you build your training session? Static stretches ... or dynamic? And why? How can you train your abdominal muscles in a useful and efficient way? We could count on the cooperation of top athletes/soccer players like Jonas Ivens, Nana Asare, Tom Caluwé, Yoni Buyens and a lot of other volunteers. We thank all participants for their good intentions to be an example for thousands of others. Buy our soccer DVD now and recieve a discount of 75,00 euro for a training demo at your favorite club!!! This inaugural event is a 2-day seminar that features over 30 Presenters and Presentations by Fellows of Applied Functional Science™ from around the world. The common thread of Applied Functional Science™ ? the science of human movement ? will weave through all presentations and will empower the audience in the Principle-Strategy-Technique Process in order to better care for and serve all patients / clients in the areas of assessment, training and conditioning, rehabilitation, and injury prevention in the movement industry. WHAT SETS THIS APART FROM THE INDUSTRY IS THE FACT THAT THE ATTENDEES WILL SEE EVERY PRESENTATION AS EACH ONE IS DONE ON ONE PRIMARY STAGE. The goal of the AFS Symposium is to further teach Applied Functional Science™ with the focus on application - on movements. For more information, including the topics and presenters. Stability training for soccer players...a different point of view. Article: Applied Functional Science and Personal training in soccer. Are Anterior Cruciate Ligament (ACL) injuries epidemic in soccer? We offer you the DVD with or without the database of 70 functional exercises (29,95 euro). If you take them both, you get a discount, just scroll a bit lower to Order the DVD + DATABASE. If you don't have a PayPal account yet and you prefer to make a money transfer, that is no problem, send us an email and we will give you all the necessary details. Thank you very much! Please send us your VAT number with the order! thx! Database of 70 functional exercises: 29,95 euro (login system). Willem, Act2Prevent and his teammembers are ready to give trainings-sessions at your soccer club and answer all your questions. Final conclusion is that the demo was very interesting and certainly recommended to the clubs. We also welcome questions from other sports. Just a quick note to let you know I got through the entire injury prevention and strength training by mobility and flexibility video. Flat out awesome job. We really appreciate your thoughtfulness and kindness with respect to your remarks at the beginning of the video. I believe you did just a really good job making it very clear and easy to follow along. Even without the subtitles, I truly believe I would know what you're saying because you said it so well. Your DVD is great. You have learned your lessens well and taken them and applied to football/soccer. I am a MAT Specialist®, NASM Certified Personal Trainer, and AFAA Group Fitness Certified Instructor. I work at Loyola's Center for Health and Fitness which is a Hospital based fitness Center, as well as a private studio in Western Springs Illinois called P2 Training Systems. I work on and train all ages and all populations including people who are inactive to very highly trained athletes. Oddly enough, I do not have any soccer players. After hearing you talk at the Symposium and talking to you personally afterward, I was very interested in your DVD. I remember you asking me if I was a soccer player or whether I had trained any soccer athletes. I had a class in soccer in college but that is the extent of that. Anyway, I loved your DVD. I found it very applicable with almost all of my training clients. I have even gone so far as implement some of the exercises in my strength training class that I teach. The students loved it!!! I thought it was very thorough and the explanations were very clear. The only downside was that I had to read subtitles in the beginning J. I think the 3d approach to training muscles is definitely the way to go. I also liked the functional abdominal training. I was a little nervous about the response I might get in my class but again they loved it. SO thank you for your very thorough and insightful DVD. I look forward to reading your Functional Stretching Program for Soccer Players. Through my collaboration with Willem Timmermans I got the DVD: 'Injury prevention and strength-training for soccer players' in hand. This DVD is in my soccer DVD collection, absolutely the best without any competition. He fills the need that is already out there for a while. Attention is given to each exercise that is important in my job as a rehabilitation trainer. Clear exercises, to the point 'with smooth', support explanation. I found it a very interesting example that you should not have a fully equipped gym to do strength training. This DVD definitely contributes to the quality of rehabilitation, fitness and strength training. I look forward to a future release. Your DVD ( concerning injury prevention and strength-training in soccer ) is well-composed and clear. I've already learned a lot and am now putting it in practice. Interesting DVD with useful exercises, immediately usable in the field. Slightly different approach than the conventional warming-up exercises and injury prevention as well as variation for your players. Willem, I am completely 'fan' of this way of working. I am firmly convinced that these exercises will have their results. Even in my club I recommend this method and we will also motivate the trainers using the process in their training! Hello Willem, My name is Marc daerden and I recently bought your DVD and also came to your education in Beveren on November 1. I train currently a U15 team at the regional level. My training is, after watching your DVD, launched with a systematic 3D warming-up. The team has 18 players since the start of the competition and I have not had any injured player till now. 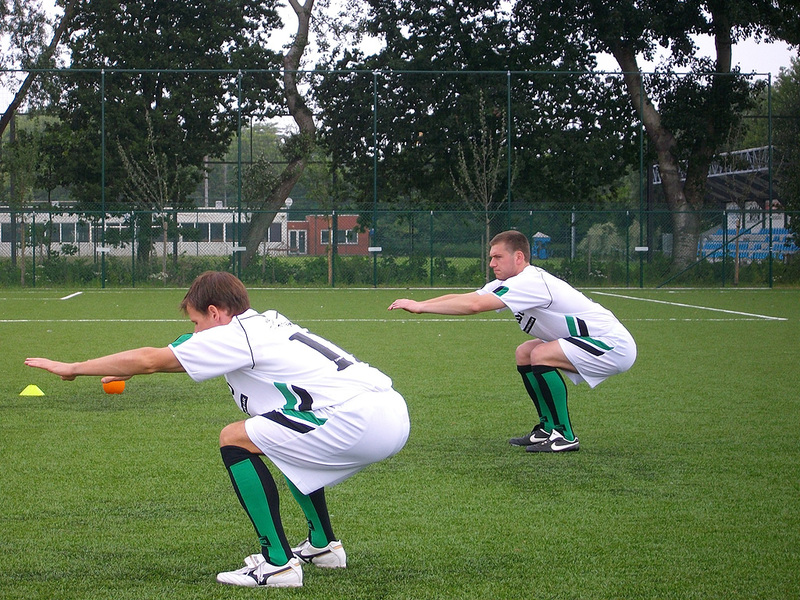 We also use the 'tools' in the warming-up for the game. In the beginning the players found it a bit new and strange, but meanwhile they are used to it. After purchasing the DVD, I immediately put myself to work to study all the movements and idea's. Then I just thought how it can be best incorporated into my training schedule. Because of the this video I do my warming-up as dynamic as possible, using the movements shown on the DVD (graduated in difficulty). As TVJO of our club, I also shared about my experiences with our national coaches. I now observe that some coaches also recognize the advantages and increasing the use of this type of exercise (instead of the static trunk / coordination / stability exercises). If there is a sequel to this DVD, I am definitely interested. Regards, on behalf Waasland - Beveren. I have gone through the soccer-DVD: 'Injury and Strength training by mobility and flexibility' and it has shown me that strength training and injury prevention can be done in a more dynamic way. I'll try to apply this with my soccer players. I bought the DVD: 'Injury prevention and strength-training by mobility and flexibility', really TOP and I think every soccer trainer should have this at home. The reason I think the DVD is really TOP is because you explain the content, normally given by specialists, in an understandable and constructive manner. You always start from a simple process and slowly go to a more complex form. I am now integrating those exercises in my own training and I am starting with the easy form and then later i will proceed to the more complex forms. As a soccer-trainer, I tried the exercises myself so that I can implement them correctly and indeed... you feel a lot better once you've practiced them. It's up to the trainer to convince the players that they will become better and that it is a goal to create a habit doing those exercises during a workout and perform them at home. I had the privelege to work with Willem. Unfortunately his personal business is growing so rapidly that there is no time left for our club. On very short term we could see that his lifestyle program, fysical training and personal approach were pionering but very efficient and adequate for the Youth Academy of YR KV Mechelen. Although Willem isn't with us anymore, his programm still being used by our technical staff. The DVD is a must for all people working with youngsters in sport. The contents of the soccer DVD 'Injury prevention and strength training by mobility and flexibility' is very good and complete. After I learned the exercises myselve I have start teaching them a few weeks ago to my team . At first they were surprised and didn't know what was the advantage doing these exercises. After I had explained several times some exercises and showed examples, and especially after they had practiced the exercises several times themselves, most players felt a difference. Most players like this a lot now. I introduce this exercises slowly in my training. I am also convinced that at the longer term this will ensure less injuries. I will definitely check new information on this site regularly and continue to implement the 'tools'. Greetings from a satisfied customer. The DVD is both for professionals and recreational soccer players (what we are). From the beginning, the basic principles of APS are clearly explained and I will certainly implement them immediately after the winter -break, especially the 3D movements and... from stability to mostability. In our warming up, we will start mobilizing the foot: heel and big toe and hips swing. What I have learned is that there are several possibilities to train your abs and not only lying on the ground... Tweaking was something new and that's what I will implement during the second half of the season. I'm looking forward to your newest functional stretch-program for soccer players. The DVD is awesome, and I was wondering if there are any courses/ clinics planned in Belgium? I am very excited about the information obtained from the soccer DVD and I am planning to apply it as soon as possible to my goalkeepers. The soccer DVD is very informative and gives much greater tools for effective and functional training of our women's team. We will apply it as soon as possible. 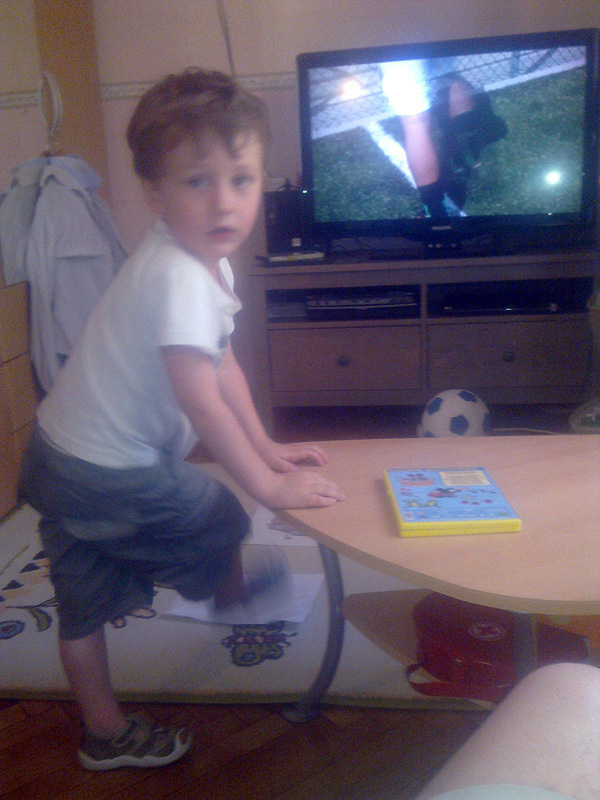 I was watching the DVD and my son wanted to test and enjoyed it! I wish I could have the chance to learn good basics at his age! Nice for him!! With a background in sports and science (graduate physical education, UEFA A soccer trainer ) and current founder of www.sportcareers.be I have watched the 'soccer DVD : Injury prevention and strength training by mobility and flexibility' with great interest. Functional ( strength ) training is very important, nevertheless, is still not very well known and applied. This soccer DVD shows the key principles and how you can apply them correctly in soccer practice. I will definitely use these innovative insights and advise all the soccer trainers/soccer coaches to include it in their training. I have watched the DVD already 2 times and I am impressed by the warming-up for soccer. I am connected to a soccer club and they want a start-up a type of injury prevention plan... and the insights of the soccer DVD in the warming-up part are so very useful for that. I plan to explain the warming-up exercises to the coaches and board members of the soccer club. This DVD is definitely a must for any modern soccer player and soccer coach. I was already working on dynamic stretching and warming-up, but this soccer DVD has greatly expanded my knowledge. Ideal to influence the thoughts of the "old-fashioned guard" , and also much better for the players themselves. I'm already looking forward to 'the functional stretching program for soccer players and soccer coaches'. I like your dvd ; it is very innovative. Hi Willem, I've looked with great interest to the DVD, the content is very clear. I'm very curious about the abdominal program, the most important thing is that I am open to further develop myself. I myself am already a football trainer for years at a decent level, and I myself am plenty busy with fitness in order to stay fit. 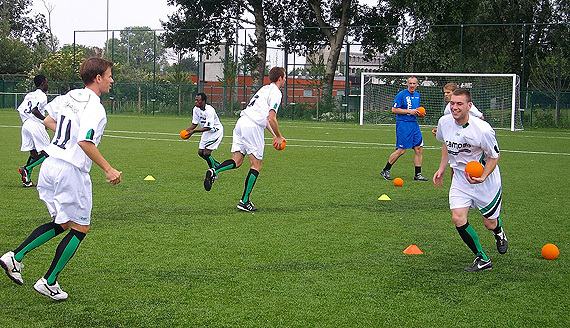 Football coach AFS (Amsterdam Football Club). 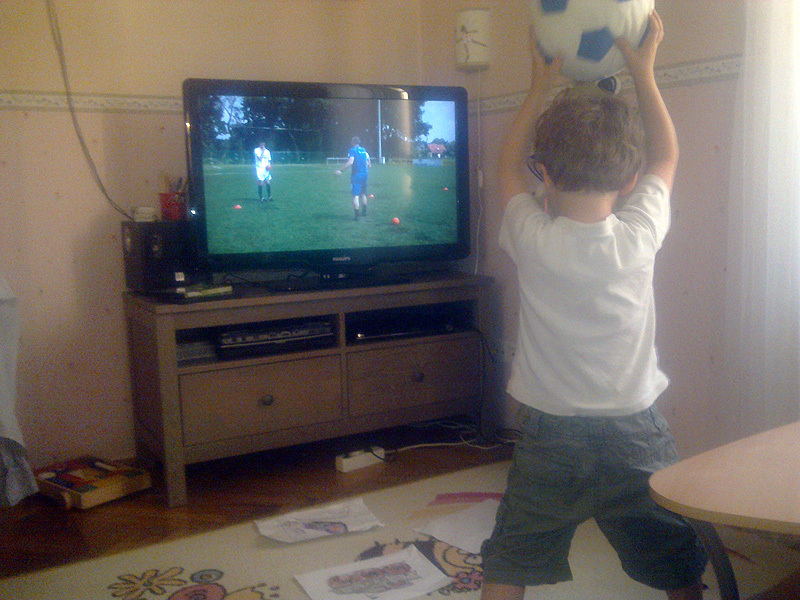 Thanks for the football DVD: Injury Prevention and Strength training by mobility and flexibility! I am going to introduce the exercises immediately at my football club. I definitely use this kind of exercises on my program, combining it with the rest of the training. There is a very clear and deep explanation of methodology of each variation in indoor and outdoor training. It is very easy to understand and apply it. I strictly recommend it for all categories of football training, from youths to professional area! "Coach Timmermans has created an amazing resource with ground breaking approaches to both injury prevention and athletic performance specifically for the footballer/soccer player. It is very user friendly even though the material is quite sophisticated thanks to Timmermans' enjoyable and efficient teaching strategies. It should be a standard in the training library of every coach and player with a passion for great performance." I like your DVD a lot, it is very much 'to the point'. A lot of inspiring exercises, very well done! My name is Alexandre Silva and I am an assistant coach in the Under 21 Portuguese Football National Team. Congratulations for your programmes and dvd. They are being very helpful to me! This soccer DVD is exactly what I was looking for some time already. As a soccer coach I was focusing on injury prevention for a long time. I've followed various courses in the field of rehabilitation, testing and periodization of football conditioning. I didn't feel comfortable with the frequently used FIFA11+ injury prevention program because the exercises has little or nothing to do with soccer movements. In this DVD I could see the movements as they appear in soccer, the closer you get to the actual movement, the better the result for the player. This DVD is a great help to increase the quality in rehabilitation, fitness and strength training. Perhaps we can work together in the future to offer specific training in the area of individual training within the team process. I will certainly introduce this insights and way of training with my teams and fellow trainers/coaches.